As a coach, you know the important role that threshold plays in an athlete’s training. It is not only an important zone to train in, it also sets the limits to the other training zones. For many coaches, keeping track of every athlete’s threshold value can be difficult. You can always schedule a threshold test, but often athletes get worried and worked up when they see the word “test” in a workout. Also, it can be difficult just to keep track of who is due for testing when you have a lot of athletes to keep track of. The new Threshold Improvement Notification feature was created to help you stay up to date with your athletes threshold values in a quick and convenient way. This feature, introduced a few months ago, allows you to be notified via email when any athlete sets a new threshold value in any sport. Not only can you view the new threshold value, but if you choose, TrainingPeaks can automatically update that client’s threshold value and their training zones (as long as you haven’t manually adjusted their zones within TrainingPeaks). You can also control whether or not your athlete sees this new threshold value as well. Heart Rate Threshold: We suggest a threshold increase if your athlete’s Peak 60 Min OR 95% of their Peak 20 Min Heart Rate (whichever is higher) is greater than the currently set threshold. Power Threshold (Bike Only): We suggest a threshold increase if NP (Normalized Power) Peak 60 Min OR 95% of their Average Peak 20 Min Power (whichever is higher) is greater than the currently set threshold. With three options to choose from, any coach can benefit from this feature. Do you only coach runners? Then the heart rate or pace option is best. 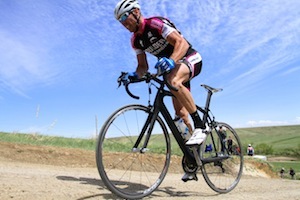 Work with a high level cyclist? Use the power or heart rate option. 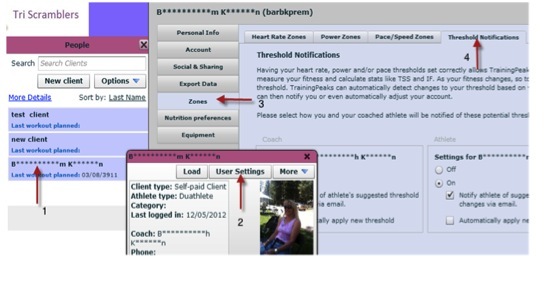 Multisport coaches can track their clients’ biking and running. It also means that the athlete does not need a specific device. Any device that records these metrics will allow you to use the Threshold Improvement Notification. It is important to note that the Threshold Improvement Notification is not turned on automatically for every athlete. Coaches can choose to turn on these notifications by going to the athlete’s Account Settings and clicking the Zones tab on the left. In the corresponding window, choose the Threshold Notifications tab in the far right. There will be two boxes, one for you the coach and another for the athlete. By selecting the corresponding buttons you can choose what you will view and what your athlete will see. Coaches will have control over this function provided they are the owner of the athlete’s account. Coaches should note that a Self Paid Premium athlete will also have access to this feature. As you know, motivating an athlete can often be the hardest part of coaching. Nothing is more motivating to an athlete than confirmation that they are improving and getting faster. Coaches can allow their athletes to receive the notification, or you can set it so only you view the notification. This gives you the opportunity to deliver the good news. Keeping the threshold value current is also critical for any coach that uses the Performance Management Chart. In the PMC you can quickly find long term trends and follow work loads. The PMC relies heavily on metrics like Training Stress Score and Intensity Factor, which in turn are created using threshold values. If you start with an out-of -date threshold value it can be difficult to determine how the athlete is truly performing. By turning on the Threshold Improvement Notification you will always have the correct value and be getting information you can trust. No longer do you have to wait until a scheduled test is performed to change the athletes threshold value. If an athlete sets a new threshold during a hard, race-like effort or race itself, you will be updated. Field tests are still a great option, but are no longer the only way to get new threshold values. Additionally, with this feature you no don’t have to comb through the data to determine if a new threshold is needed. The precise algorithm we’ve created automatically calculates the values for you, saving you valuable time. The value of the Threshold Improvement Notification feature is significant because it gives you valuable information in a single step and saves you time. Turn on this tool and see what it can do for you. Using the Threshold Improvement Notification feature is a simple step that can make you, and your athletes, more successful.